We are our own worst critics. We can more easily point out our flaws and our weaknesses than our strengths. But, we can't let that determine our value. Don't compare and look at yourself in the eyes of someone who doesn't see the true you. Look at all aspects of yourself. Be accepting of the things that you can't change. Only we can decide our true worth. You can't let someone else decide it for you. Choose to be your best self. If you hold yourself with high value, others will also. 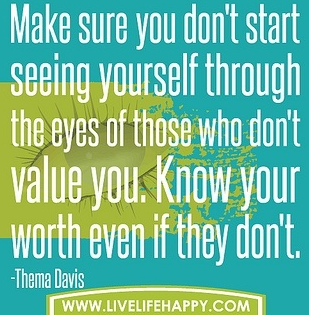 Your worth depends on you. Don't let someone who doesn't matter, determine it for you.